How did Haleo start off? 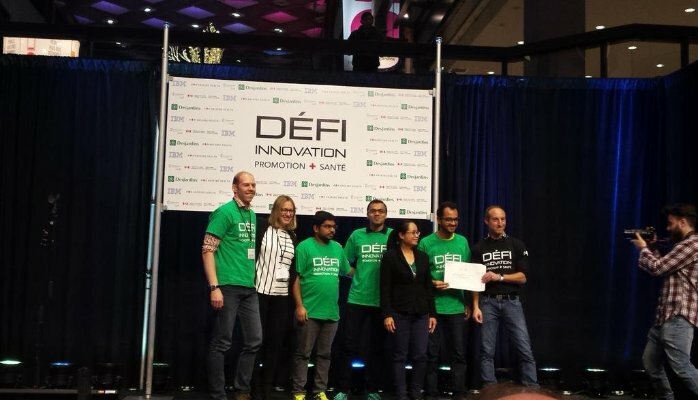 We formed a team during Hacking Health Montreal’s Défi Innovation Santé, prototyped our app in 30 hours and ended up winning the Public Health Agency of Canada prize, which includes training and market research support from Canada’s prestigious MaRS Venture Services. We’re a user-friendly mobile app that tracks both the client’s sleep behaviour and state of mental health. We included a medical rationale for properly segmenting of client screening results, and a standardized, web-based report for the medical professional that clearly flags when the key indicators of sleep apnea and mental distress are at levels that require medical attention. – accelerating and improving coordinated care for people potentially suffering from sleep disordered breathing. As we speak it’s been 6 months since the hackathon, what have you been up to? The HALEO Healthy Sleep Program is coming along nicely. We’ve completed a prototype service consisting of the protocols, decision trees and reports for sleep disorder screening. It involves a combination of clinical tools, including digital questionnaires and a medical device approved by Health Canada and the FDA for sleep disorder screening. Since mid-April we have been testing the prototype service with clients from two of HALEO’s partner pharmacies. Congrats on the regulatory approvals! What type of support do you have for your project’s development? The HALEO Medical Advisory Committee is also becoming an increasingly critical part of the project. The committee is responsible for evaluating the HALEO Healthy Sleep Program prior to its commercialisation. The members of this committee, which includes 4 clinical psychologists, 2 neurologists, an ENT specialist, a respiratory technician and a pulmonologist, each have between 10 and 30 years of sleep clinic experience and are among the leaders in their respective specialties in Canada (some at a global level). This highly talented group have dedicated their careers to improving population sleep health and are intrigued by the potential of the HALEO solution. What do you have in store for the future? HALEO is now finalizing and validating the Healthy Sleep Program, and is preparing a training course for pharmacists and their teams. Our objective is to launch the service (including our website!) in the next month and to be distributed in 15 pharmacies participating in the Pharmacie 3.0 initiative by the end of the summer. We are also working on a telemedicine initiative to accelerate the development of the Healthy Sleep Program in other channels and geographic territories. Anyone interested in learning more about HALEO can contact me at brad@haleo.ca. Furthermore, the HALEO Healthy Sleep Program has the potential to generate detailed biometric and self-reported sleep data on a scale that could be highly beneficial to clinical sleep research. And finally…from the Hackathon to the Bootcamp and beyond, a big thanks to HackingHealth for its ongoing support of HALEO!